The first Oceania Skyrunning race on Aussie turf – 45/36/22km options. The field looked relatively small due to being just 2 weeks before Buffalo – I assume most sensible people are tapering up for that. However, there were still enough of us out there to give the course and each other a good smashing. They changed the start/finish from the valley to the summit village this year, so the course basically consists of 15km undulations (Mt Stirling, Craig’s Hut, etc. ), 15km descent (down to Mirimbah), 15km climb (up to Buller summit and village). Mick Donges pulled out, still injured from Six Foot Track, and Coops wasn’t feeling it so he dropped to the 36km. I figured this left Dave Byrne and John Winsbury as the main competition and didn’t really rate my chances against them, but there was still a podium spot up for grabs! On the Saturday arvo I had a couple of MTB stacks while attempting the Bike Buller Epic trail – one of which involved stabbing my handlebar end into my rib cage – thankfully no major harm done, and I made it to the shuttle bus with a whole 3 minutes to spare. Phew! It had snowed a tiny bit on the Thursday before the race, so Sunday morning at 7am (just before sunrise) it was a chilly 3 degrees for the race start. Stark contrast to this time last year when we were on bushfire alert and suffering dehydration during the race. We took off at a relatively easy pace (considering it was being set by Dave) but it quickly turned into Dave+John up front, myself+Ross Hopkins chasing, then Coops sitting in behind us. Ross was creeping away from me on every climb, but by the time we had visited Craig’s Hut and hit Mt Stirling summit for the second time, he was almost out of sight. I needed to take a risk if I wanted 3rd place, so I absolutely flogged the 15km downhill to Mirimbah, caught Ross halfway down, then tried to build a lead and cling on for the final 1000m climb. At this point I saw one of my 36km Canberra buddies, Jeremy Walker, crouched down on the trail and suffering from ITB issues. This guy is normally the most positive and excited person you could see on the mountain, so clearly he was in a lot of pain. I rushed through the Mirimbah checkpoint with Jacinta O’Neill who helped me refill a water bottle and get through quickly. I started the climb like a scared little rabbit, looking over my shoulder at every corner, expecting to see Ross chasing me down. Instead, I came upon John Winsbury, who was having some lingering energy/sickness issues and wasn’t in a good way. Woohoo, this was exciting. Next I hit the aptly named ‘thank Christ corner’ – about halfway up Klingsporn trail, where it changes from relentless runnable uphill into flat sections with short hiking pinches – much better! It wasn’t long until I popped out on to the ski run near the top of the climb – this bit was long, steep, straight and clear – perfect for scoping out your competition ahead of the last 5km to the finish. I couldn’t see John or Ross behind me, so I figured a 5+ minute lead should be enough to get me home. The trail wraps around towards the summit, then there’s a final little out and back to touch the trig. Surprisingly, I saw Dave coming off here, just 1km ahead of me, and I think we both got a fright! We all seemed to be cramping up in those final couple of km, and I crossed the line in 4:20, 5mins behind Dave and a half hour PB over my 2014 time. We were privileged to see TWO(!) sprint finishes, with Emma Rilen getting the better of John Winsbury then Lucy Bartholomew pipping Christine Hopkins on the line. 45km podium was Emma Rilen, Lucy Bartholomew, Christine Hopkins for the ladies, then Dave Byrne, Tom Brazier, Ross Hopkins for the guys. Surrounded by couples on the podium! We hadn’t met the Hopkins’ before but watch out for them at Buffalo. Coops took out the 36km and Aaron Knight blitzed the 22km. After presentations and packing up the finish line we headed over to Bright to watch the cricket world cup final. Aussie dominance! Marcus, Matt, Gill and I scoped out some important sites ahead of the Buffalo stampede such as Bright Velo, the brewery, Mick’s Track, Buffalo Big Walk and Chalwell Galleries. 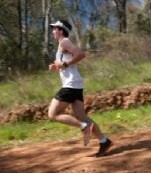 Now for a relaxing Easter weekend in Jindy (plus some sneaky running/hiking), tapering for the big Buffalo next weekend! Photos by Matt Adams, Marcus Warner and me. Good write up Tom! Lookin’ forward to running with you for as long as possible at Buffalo next week.